Welcome to the information page for the listening bench installed in Galleywood, Essex. The recordings on the bench were selected from recordings made by the Galleywood Historical Society’s Oral History Project, which aims to capture memories of village life in the 1940s, 1950s, and 1960s. The clips cover a range of aspects of village life, dating from the 1930s onwards. 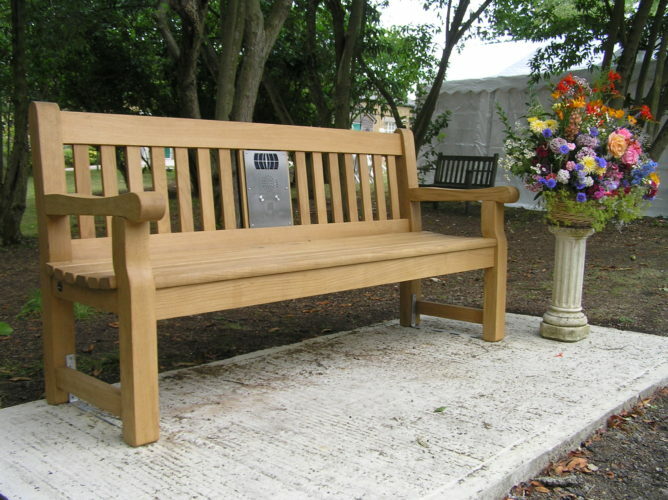 The bench is located at the Galleywood Heritage Centre, in the field opposite the main entrance to the Centre. The bench recordings were chosen and put together by the Galleywood History Society, who also recorded the interviews. The Galleywood Historical Society was founded in 1998 and aims to promote interest in the history of Galleywood and its surrounding areas. It holds an annual programme of four talks by invited and local speakers and publishes a quarterly newsletter ,‘Past Times’, containing articles of local historical interest. For more information visit their website. Brian Stubbings describes his parents’ jobs when he was growing up in Galleywood. Tony Lodge recalls hearing the declaration of war with Germany and his father’s attempt at building an air raid shelter in 1939. Madeleine Howard describes the commoners’ rights that came with her house. Gwen Cove recalls her schooling, including assemblies with Rev. Roughton and theatrical productions. Madeleine Howard worked at the Ace Fruit Packing Centre, which sometimes included chasing runaway cattle out of the orchards. Edith and Lee Seaman on what life was like in the village in the 1950s, buying fruit from local growers and using the local newsagent.